How Important is Time Management? Sure, Philadelphia is a great city for historical sites and architectural treasures, but it's also ideal for gorging on sweets. The City of Brotherly Love loves its confections, and a trip to the city is enriched by visits to confectioneries and ice cream shops. Benjamin Franklin, Philadelphia's most famous resident, may have warned people not to "live to eat," but most likely he would have approved of a Philly ice cream and candy tour. You might start your sugary adventure at Lore's Chocolates, owned by father and son chocolatiers Tony Walter Sr. and Tony Walter Jr. Their factory and store on Wyoming Avenue is where they make a majority of their treats. Here you'll find delectable buttercreams, chocolate-covered pretzels, and takeout espresso. Lore's also makes personalized chocolates for weddings, and hosts birthday parties in which kids can tour the assembly line. Every Palm Sunday, the shop holds an open house, which includes an opportunity for customers to make their own chocolate eggs, and a special appearance by the Easter Bunny himself. Shane Candies has been open since 1876, making it one of the oldest candy shops in the United States. Located on Market Street, it's carried the "Shane" name since 1911, when Edward Shane purchased it. Two more generations of Shanes operated this business, and then it was sold to brothers Eric and Ryan Berley in 2010. The Berleys restored the building, and today it houses an array of antiques, including marble counters, brass scales and copper kettles. If you're adventuresome, try the chocolate-covered bacon. The Berleys also own Franklin Fountain, a couple doors down the street from Shane. Like Shane, the interior of Franklin Fountain might make you feel as though you've gone back in time, right down to the wrought-iron chairs. Since it debuted in 2004, Franklin has served homemade ice cream and egg creams. 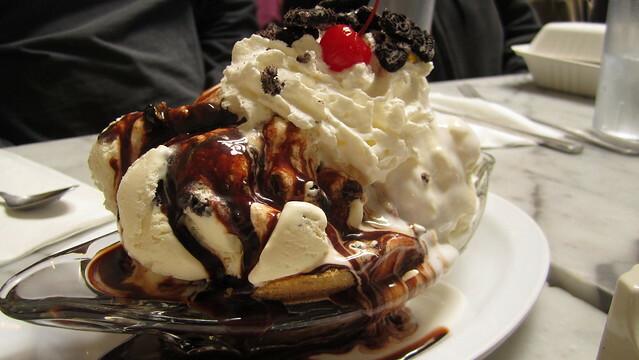 Their banana splits feature five scoops of ice cream, and come in antique dishes. For its part, Bassett's Ice Cream has been a fixture at the Reading Terminal since 1893. You can buy Bassett's ice cream in other locations, but for a true Philadelphia experience, you must sit at the marble counter inside the crowded marketplace to savor your float or sundae. By the way, the Bassett family still runs this shop. Scoop DeVille can be pricey, but its flavors and ice cream combinations are highly creative. The shop mixes ingredients into its sundaes which are not often used in ice cream parlors, including breakfast cereals, graham crackers, granola, nutmeg, wasabi powder and Nutella. In April 2013, after years on Chestnut Street, Scoop DeVille closed that facility to move to a new home. If you prefer gelato to ice cream, Capogiro Gelato is a must. Stephanie and John Reitano were vacationing in Italy, where John hails from, and enjoying the local gelato when they decided to open their own shop in the United States. Stephanie prides herself on obtaining the ingredients for her gelato from farms in the Philadelphia area. Each day's batch is made fresh in the morning, too, and the shop offers seasonal treats as well as year-round favorites. Chloe's Corner is inviting from first glance – painted bright white, with a colorful awning and an outdoor seating area. It might be tiny, but its delicacies include peanut butter swirl, a local favorite, as well as water ice. Water ice is a frozen treat that's free of fat, a perfect option for anyone who's lactose intolerant. Note that this shop only accepts cash if you buy something for less than ten dollars. Kevin Caldwell is the owner of Philadelphia Airport Hotel Guides, which helps people find hotel conveniently located to the Philadelphia airport. Kevin often writes about places to go and tips about travel.